"As far as the crucifixion of Christ is concerned, why would God confuse people by making a man that is not Jesus look like Jesus so that people would believe that Jesus was crucified?" I posted that I did not know the answer, but would try to find a scholar that could respond to his concern. I am sincerely looking for some help on this matter. Assalaamu 'alaykum sister Sakeenah and welcome to the forum. Can you please add the excerpt here? InshaAllah we'll try and get an answer however the first thing for a Muslim (if the questioner is a Muslim) is that we do not question the decisions of Allah subhaanahu wata'ala. 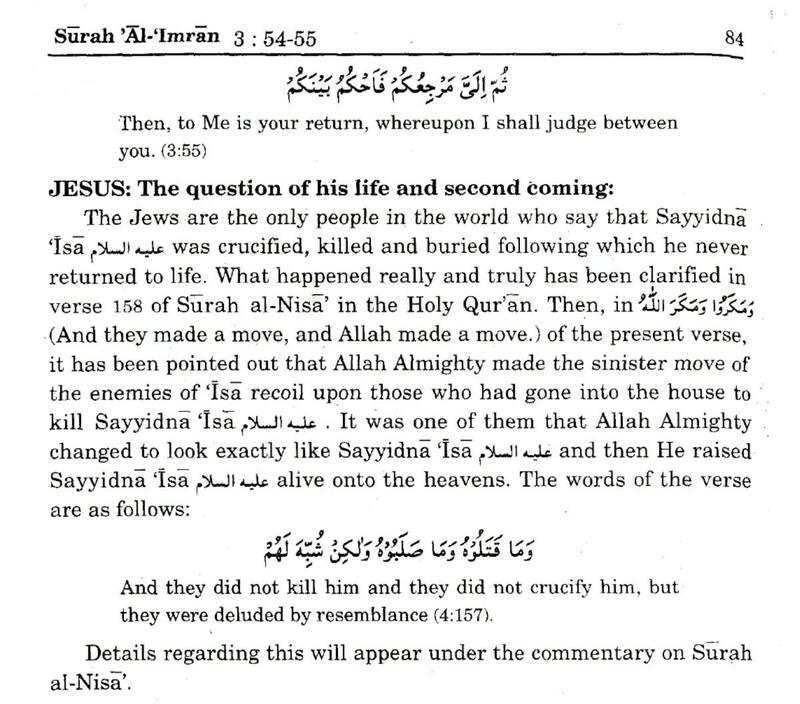 In the present verses (157-158) of Surah al-Nisa', it has been made explicit that they did not kill nor crucify Sayyidna 'Isa (A.S), rather, what actually happened was that they were deluded by resemblance. How Were the Jews 'Deluded by Resemblance'? 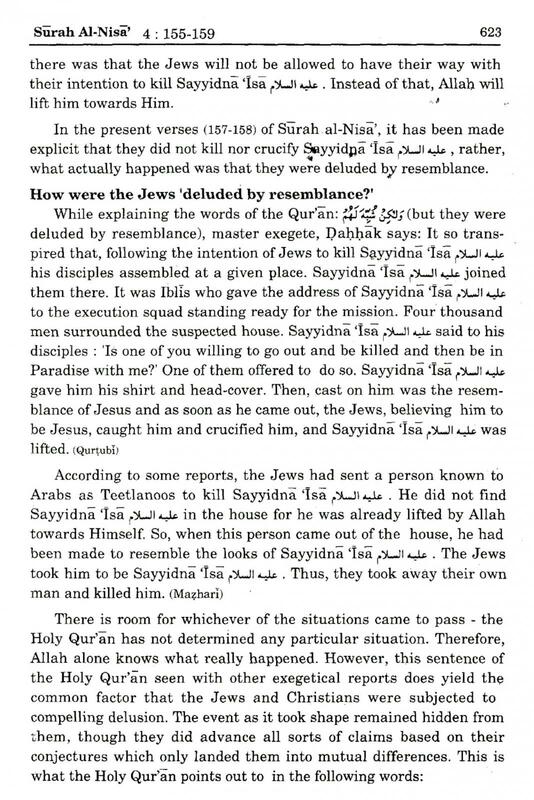 While explaining the words of the Qur'an: (but they were deluded by resemblance), master exegete, Dahhak says: It so transpired that, following the intention of Jews to kill Sayyidna 'Isa (A.S) his disciples assembled at a given place. Sayyidna 'Isa (A.S) joined them there. It was Iblis who gave the address of Sayyidna 'Isa (A.S) to the execution squad standing ready for the mission. And those who disputed in this matter are certainly in doubt about it. They have no knowledge of it, but they follow whims. It means that they do not have certitude based on any true knowledge. The diverse claims put forward by those who have differed in the case of Masih (A.S) are simply based on doubt and conjecture. 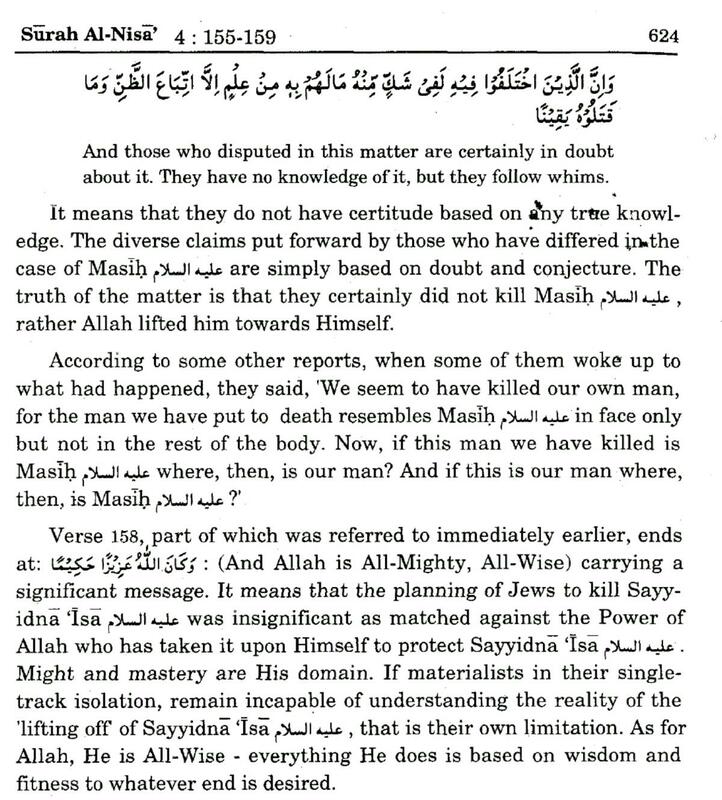 The truth of the matter is that they certainly did not kill Masih (A.S), rather Allah lifted him towards Himself. According to some other reports, when some of them woke up to what had happened, they said, 'We seem to have killed our own man, for the man we have put to death resembles Masih (A.S) in face only but not in the rest of the body. Verse 158, part of which was referred to immediately earlier, ends at: : (And Allah is All-Mighty, All-Wise) carrying a significant message. It means that the planning of Jews to kill Sayyidna 'Isa (A.S) was insignificant as matched against the Power of Allah who has taken it upon Himself to protect Sayyidna 'Isa (A.S). Might and mastery are His domain. If materialists in their single-track isolation, remain incapable of understanding the reality of the 'lifting off of Sayyidna 'Isa (A.S), that is their own limitation. As for Allah, He is All-Wise - everything He does is based on wisdom and fitness to whatever end is desired. Because there is wisdom in what God does in every aspect; please post the response as follows and let me know the feedback so we can contnue the discussion. Christians were beginning to attribute divinity to Jesus Christ (thinking of him as divine OR son of a Divine). If God would have directly intervened in the process it would have reinforced the (false) belief in the eyes of Christians. God wants to save people from heresy so what did he do? He couldn't save himself how could he be God. He was most certainly NEITHER God NOR Son of God. All his attributes were Human. This still remains a very powerful argument until twisted by Paul and others with concoctated tails of resurrection. In the eyes of common sense and logic every ounce of divinity has been refuted and every ounce of humanity (reenforced). He was born, he lived, he was taught captured and then crucified (he was NOT divine).